For the Patients who are diabetes sufferers, keeping the blood sugar at the desired level (Fasting blood sugar level at 100-120 mg) is crucial in the long term treatment and in order to prevent Microvascular (Diabetic retinopathy, Diabetic neauropathy) and Macrovascular (Heart attack, Stroke, Diabetic foot) complications. Apart from the blood sugar level, we also monitor your hemoglobin A1C (HbA1C) which reflects the blood sugar for the past three months. 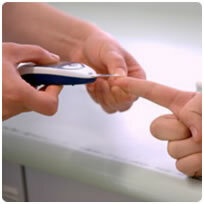 The HbA1C test also reflects the control of Diabetes with more accurate results than the simple blood sugar test.